China’s plans for Central Asia are likely to see Beijing take a tighter grip on the restive Xinjiang region. China’s New Silk Road is of interest to the West largely because of the great power rivalry that appears to be once again emerging in the Central Asian region. Some pundits have suggested that China may well be displacing the U.S. and Russia in Central Asia, a region of longstanding geostrategic significance to all parties. Of course, this is not entirely a surprise for those who predicted that U.S. military withdrawal from Afghanistan would leave a power vacuum. While economic integration with Russia holds its attractions, resistance to the geopolitical designs of Russia is finding expression amongst the wealthiest Central Asian countries. The U.S. invariably ties deals to some kind of reform. China, on the other hand, is increasingly seen by many Central Asian governments as a genuine partner for mutual security and development, not least because it does not interfere in their domestic affairs. However, China’s newly unveiled Silk Road Economic Belt initiative in effect ties Central Asia in with the restive Xinjiang region, which opens up a new angle of interest – namely, what impact the New Silk Road is likely to have on the Uighur minority in Xinjiang. Although this initiative represents China’s primary interest in energy, raw materials, and markets that will continue to drive economic growth, it cannot be understood only in economic terms. The New Silk Road is undeniably related to security issues in China’s Western frontier, beset with what Beijing calls the “three evils” of terrorism, separatism and fundamentalism. The repression of Muslim Uighurs has long inspired fighters from Central Asia (and Afghanistan) to support them. Indeed, Islamic State leader Abu Bakr al-Baghdadi’s recent threat to occupy part of Xinjiang and his message to the Uighurs that “your brothers all over the world are waiting for your rescue, and are anticipating your brigades” appears to have been taken seriously by the Chinese leadership. One can reasonably infer that Central Asia has become even more significant to the security of China. The close relationship between security concerns and economic initiatives in Central Asia has had precedent. The Shanghai Cooperation Organization (SCO) was initially established as a means to prevent “foreign jihadists” from instigating violence in the Xinjiang region, and has helped to secure assurances from Central Asian governments that they will never support “militant separatists” on the basis of religious and ethnic commonalities. Although China generally avoids domestic interference, it has used the SCO to pressure the governments of Kazakhstan and Kyrgyzstan to shut down Uighur political parties and newspapers. China’s interest in greater security cooperation within the SCO appears to also have been revived of late, an indication of how important a stable Central Asian region continues to be to security within China’s national borders. Indeed, China has just recently hosted the largest military drill with SCO members since 2004 within its own borders. It has also been working to shore up the security capabilities of its Central Asian member states through intelligence, equipment and resource sharing, in large part for counter-terrorism purposes. From this security angle, what impact the New Silk Road is likely to have on the Uighur minority in Xinjiang is a warranted concern. 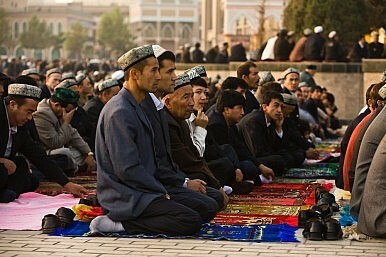 Owing to the religious and ethnic commonalities Central Asians have with the Uighur Muslim population, weaving together Xinjiang and the region could conceivably complicate China’s economic relations with the region and constrain the actions Beijing takes to contain what it understands to be foreign-inspired Islamic “terrorism.” Under the tenure of former energy and security czar Zhou Yongkang – whose star has since fallen quite dramatically – violence in the region had been escalating. The increased exercise of hard power is highly visible, not least because the repression of some of the most moderate activists has fuelled local agitation, excited the international media and the “foreign jihadists” that so worry the Chinese government. From a religious angle, it might behoove the Chinese leadership to take a different tack toward Xinjiang, especially since increased violence in the region suggests that repression is self-defeating. But how realistic is this? Certainly, some have looked to Zhou’s disgraced departure as an opening for change. However, it would appear that the Chinese leadership’s solution to unrest in Xinjiang is just more economic development and more repression in the meantime. If security cooperation within the SCO is any indication of the shared hardline approach to sources of instability in Central Asia, a sea change in China’s approach to stabilizing its Western frontier appears slim. Indeed, the Regional Anti-Terrorist Structure of the SCO issued a strongly worded statement after the April 30 train station attack last year that it “resolutely supports the Chinese government in adopting all necessary measures for fighting various forms of terrorist crimes of violence, striking at the arrogance of violent terrorists, and maintaining public security and stability.” Taking on the role as a force for stability also strengthens China’s position in the Central Asian region, further blunting any pressure that may be exerted on China to change its policies toward the Uighurs. Moreover, China ties economic incentives to security cooperation – Chinese President Xi Jinping recently offered SCO members joint projects worth $5 billion in exchange for a commitment to fight extremism in the region. Indeed, the economic benefits of working with China are too great to lose, any form of extremism would create instability and threaten prosperity, and with the rise of the Islamic State, it looks like there will continue to be little outside support for the Uighurs. Moreover, as China’s investment and trade along the New Silk Road continue to grow, the region may well become economically dependent upon Beijing. By developing extensive gas and oil pipelines, as well as developing a network of transportation links, China is making itself economically indispensable to Xinjiang and the countries lying within the modern-day Silk Road. The Chinese government also offers generous trade and loan terms, thus creating an environment in which Uighurs will continue to be repressed lest a separatist movement destabilize relations with China and jeopardize economic development. On top of that, by eliminating other major competitors, whether economic or political, countries within Central Asia do not have many other partners to turn to who can offer few of the benefits of working with China. Their investment-led diplomacy and hands-off approach to politics make the Chinese the perfect match for authoritarian governments in Central Asia. This makes for a win-win situation because Chinese trade partners in Central Asia will likely take the same hands-off approach to China’s domestic policy towards the Uighurs. Taken together, China appears to be successfully capitalizing on the economic opportunities within the region, while increasing the isolation of the Uighurs. Although religious and cultural similarities link the Uighur population in Xinjiang to its Western neighbors, the ties are only so strong when matched up against the benefits that China’s friendship can offer. As former states of the Soviet Union, countries in the Central Asian region are still establishing themselves and it is hard to do so when under the thumb of Russia. China offers itself as a viable alternative and it also allows these governments to use the great powers against one another in order to gain the greatest benefits. Countries in Central Asia are also in great need of stability and security, which gives the governments of the region and China common ground in dealing with the “foreign jihadists.” These security threats also allow for the oppression of political dissidence in Central Asia. It is telling that opposition to growing relations with China are mostly at the grassroots level in Central Asia. China’s overland prong of the “New Silk Road” is important to China because it helps to wean it from overreliance on maritime routes in the South and East China Seas, where tensions have intensified considerably in recent years. The support that the U.S. has been giving to its Pacific allies in maritime disputes has arguably increased the importance of this economic belt to the Chinese. The consequence of this is likely to be a tightening grip on the Uighurs. The iron grip will continue as economic development and national security form the foundation of China’s pivot. Su-Mei Ooi is Assistant Professor of Political Science at Butler University and Kate Trinkle was a graduating senior at Butler University at the time of writing. The downfall of its oil and security tsar gives China a chance to salvage relations with its Muslim minority.